Grandson Trent just had his fourth birthday. 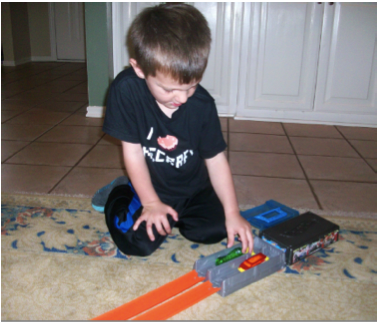 Trent is not enrolled in preschool and he spends most of the day learning through active play. 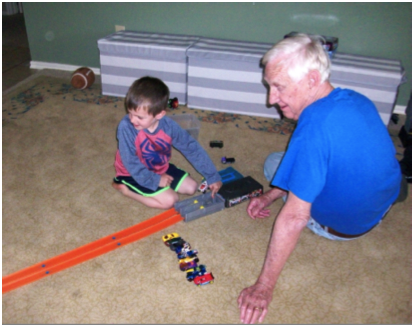 He loves to play with his Hot Wheels cars and has built quite a collection of almost 50 miniature cars and trucks. 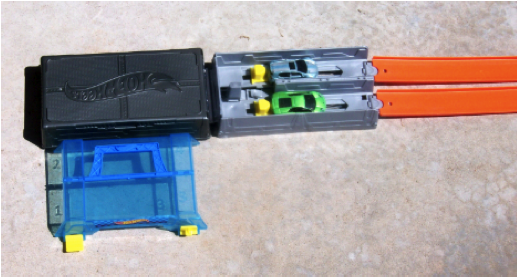 He also has a Hot Wheels storage case that doubles as a rubber band powered launcher. Sections of orange Hot Wheels track are connected to the launcher to form a double-lane race track about 8 feet in length. The launcher is $10 at the major retail stores. Pressing the center button on the launcher shoots the two cars down the track. It should come as no surprise to learn that Trent insists on pressing the launch button. Trent loves to race the cars two at a time. First, he dumps the box of cars out onto the rug. Then, we each pick a car from the pile to race. The winner takes both cars and places them in what Trent calls a “parking lot.” In the following picture Trent has just launched two cars. The 8 cars I’ve won are shown in my parking lot. The cars Trent has won are shown in his parking lot. As you can see, he has won a lot more cars than I have. Because we have raced the set of cars a number of times, Trent has a good idea as to which are the faster running cars. For this reason I always let him pick first. It turns out that his typically larger parking lot provides a wonderful set of objects for him to count. 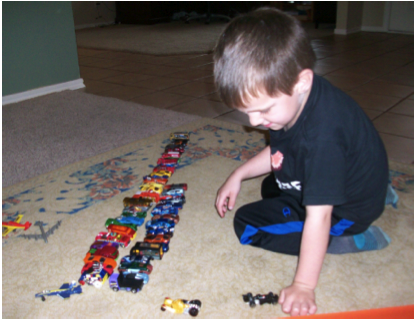 He will count the cars in his parking lot and then count the cars in my parking lot to establish who is winning. I have a wrapped Hot Wheels car ready for Trent every time he comes to the house. If I don’t give it to him when he first arrives he will ask me if I have a car for him. 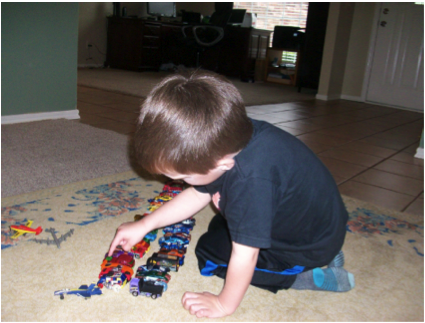 As soon as he unwraps his new cars and proclaims it to be the “fastest” car ever, we drop down on the rug, dump the box of cars, and get to racing. Trent is very competitive and wants to always win. I enforce the rule that the first car off the end of the track is the winner. I let him have the close calls but if the winner is obvious, I enforce the rule. This simple and cheap activity helps Trent learn that rules are meant to be followed and that counting a set of objects (Hot Wheels cars) can determine the overall winner. When Trent is ready, probably four or five years from now, I will revisit this activity by asking, " Trent, could you determine the fastest car in your set of cars?" The answer is to divide the set of cars into pairs forming brackets, and then race the winners of each bracket until the overall winner is determined. Perhaps at an even later time I could ask him to look at the problem mathematically by asking, "Trent, given n cars, how many races will it take to determine an overall winner?"